Gollum comes across the company. He begins to follow them. 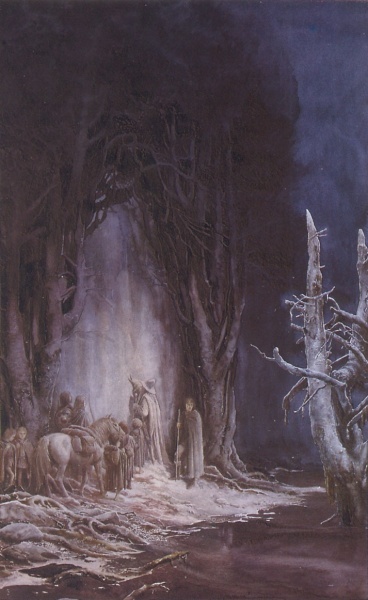 Gandalf leads them to the West-gate of Moria, where they are forced to let Bill the Pony go. Gandalf has trouble opening the door, but he eventually remembers the password with help from Merry. 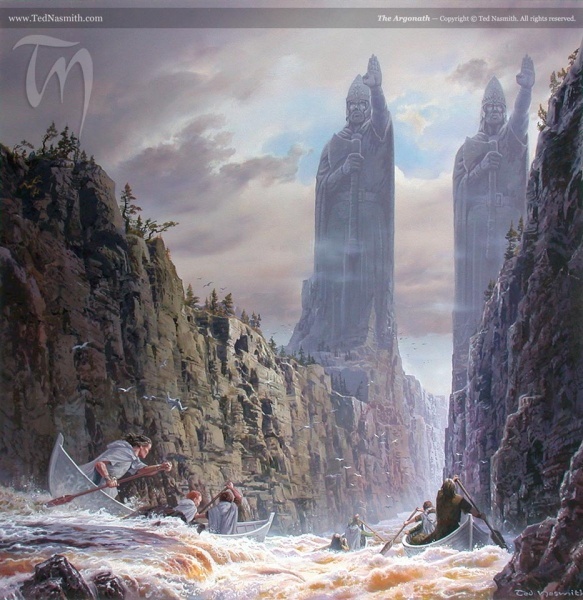 The Watcher in the Water attacks Frodo and pulls him into the water. Aragorn and Boromir save him, but as they escape into the mines the Watcher collapses the door behind them. Gandalf leads them through the many passages of Moria. Frodo thinks he hears footsteps behind him. 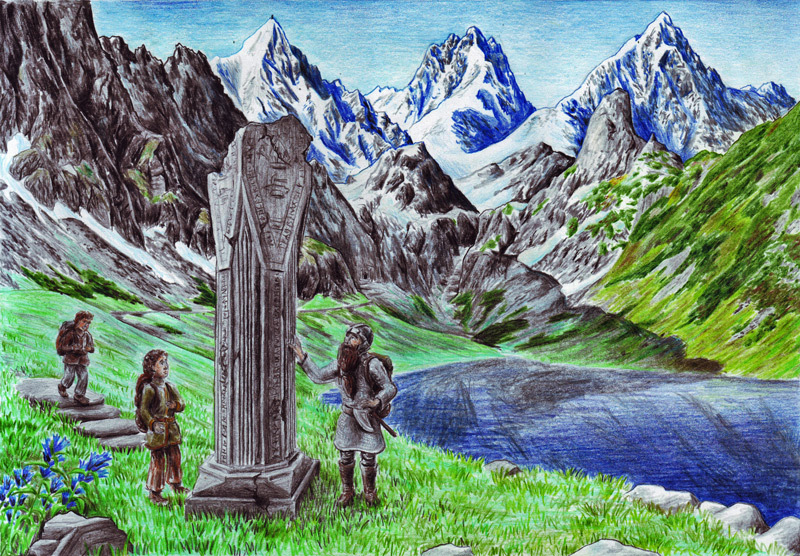 Gimli tells the others of the many wonders of Moria. They come to three passages, which stumps Gandalf. Pippin throws a rock down a well, angering Gandalf. 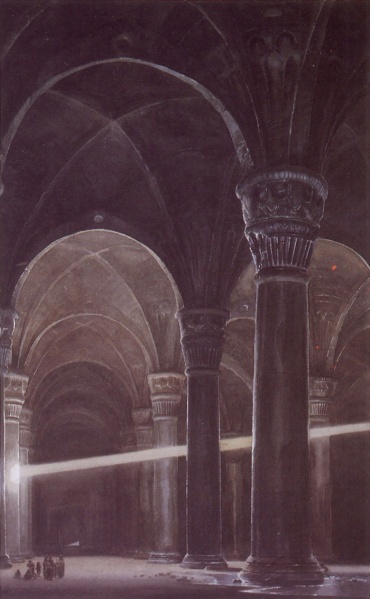 Gandalf chooses a passage, which turns out to be the right one when they find a great underground hall. 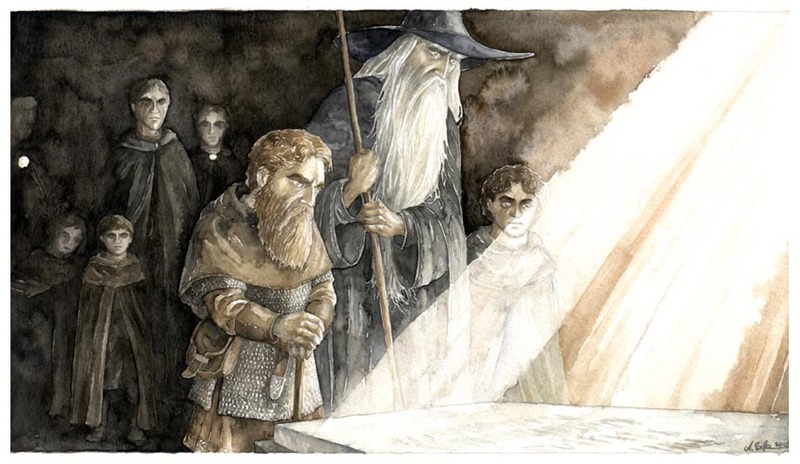 They find the Chamber of Mazarbul and Gimli mourns beside the tomb of Balin. They hear the booming of a drum in the deep, and the scurrying of feet. They bar the chamber and are attacked by orcs and a cave troll. Frodo stabs the troll’s foot and it withdraws, but an orc chieftain breaks through and stabs Frodo. Aragorn kills the chieftain and the rest of the orcs are driven off. Gandalf remains behind to seal the door. Legolas is forced to drag Gimli away from Balin’s Tomb. Gandalf is forced to flee, having met his match. They continue on down stairways, fired upon by orc archers. The orcs chase them to the Bridge of Khazad-Dum, the balrog coming upon them. Gimli leads them across the bridge while Gandalf holds it. 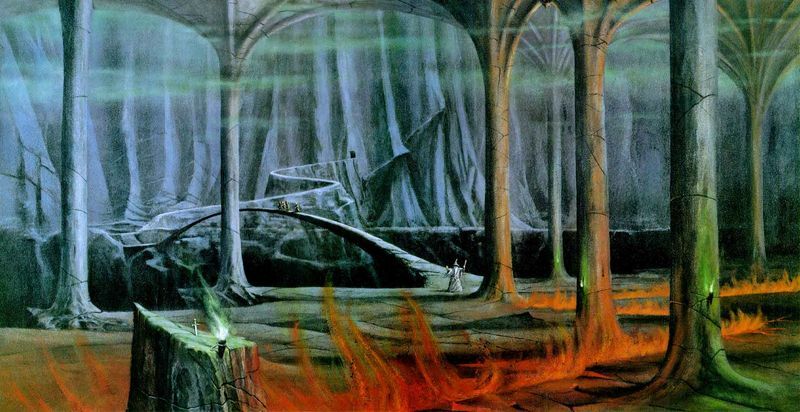 Gandalf reflects the balrog’s attacks and breaks the bridge in two, causing the balrog to fall into the abyss. 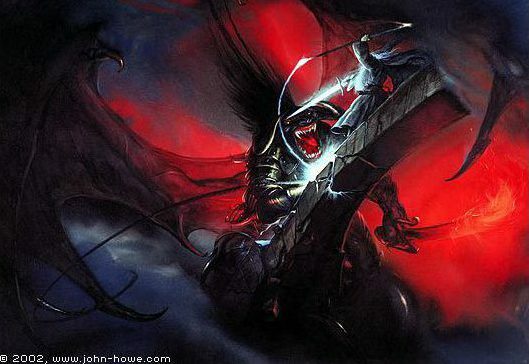 The balrog grabs Gandalf with its whip and Gandalf falls down with it. They stumble on away from the walls before collapsing. Adapted from chapters ‘A Journey in the Dark’ and ‘The Bridge of Khazad-Dum’ of The Lord of the Rings. Frodo dreams of Gandalf and the balrog atop an endless stair, a frozen mountain peak. Boromir starts to stare at Frodo often. Sam and Frodo notice Gollum following in a log. 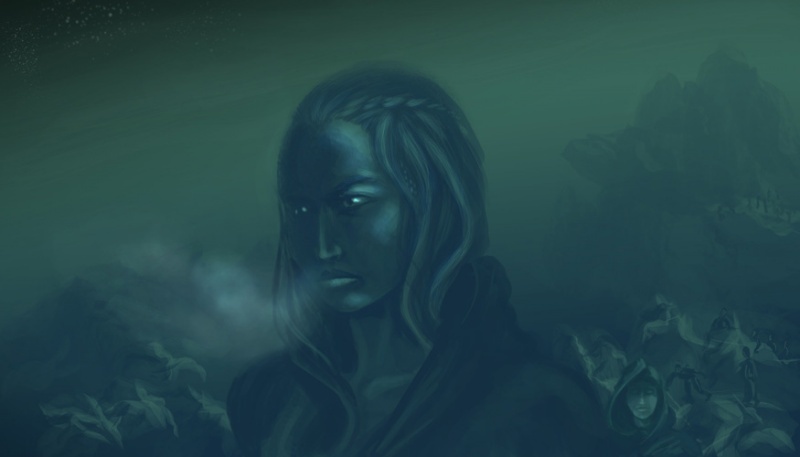 At night, Gollum comes up to the boats. Frodo draws his sword, but then Aragorn attempts to catch him, scaring him off. The company come upon the rapids of Sarn Gebir. Orcs fire arrows from the eastern shore and a great, winged shape rises. Legolas takes it down with his bow. Boromir now argues to head for Minas Tirith, but Aragorn refuses. Before the Falls of Rauros, they beach the boats near Amon Hen. Aragorn asks Frodo to decide their next course. 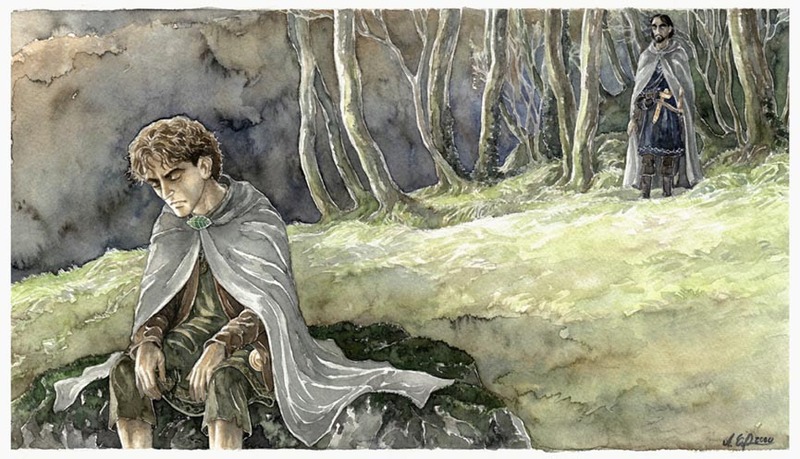 Frodo wanders off to think. Boromir follows Frodo. 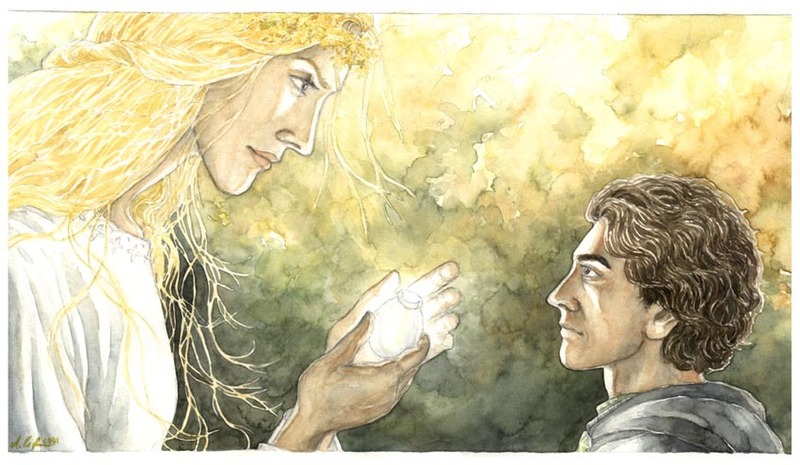 He tries to convince Frodo to take the Ring to Gondor. When Frodo disagrees, Boromir tries to take the Ring. 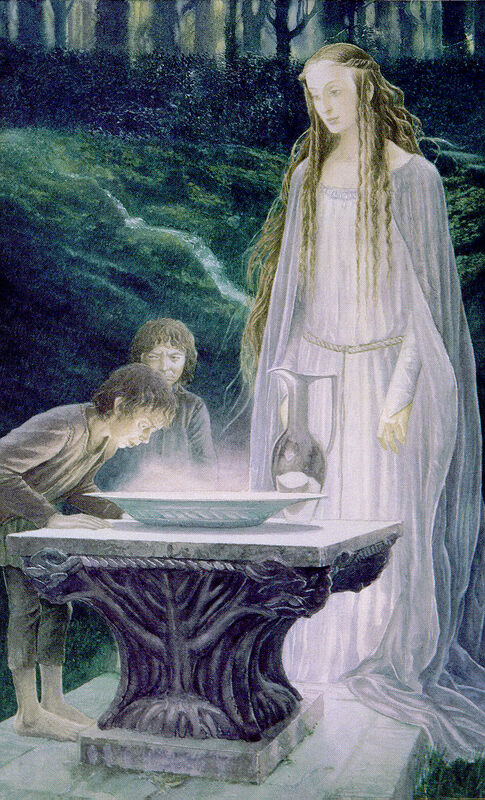 Frodo puts the Ring on and disappears. Boromir then regains his wits, weeping at his actions. 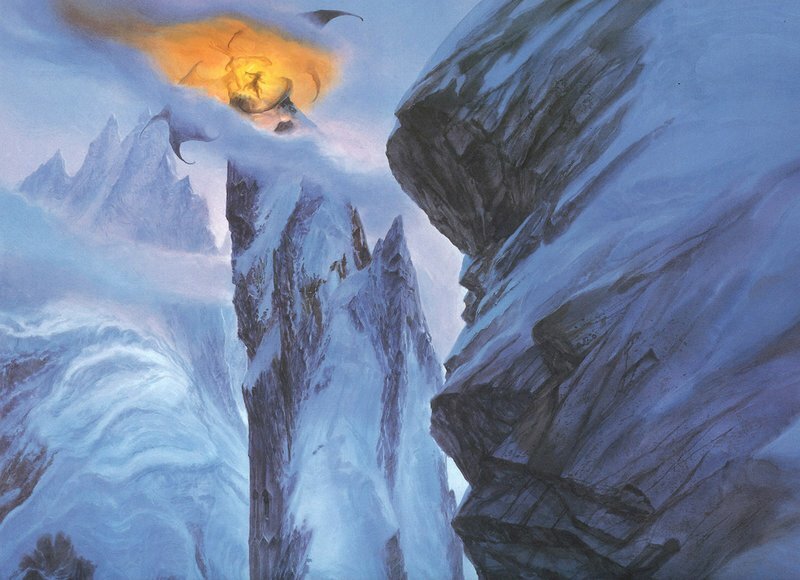 Frodo runs to the top of Amon Hen, where he sees Barad-Dur and Sauron’s eye searching for him. He takes the Ring off, before deciding he must go to Mordor alone. Aragorn and the others debate their next move, before worrying about Frodo. Boromir comes back to the camp, revealing he scared Frodo away. Sam runs off with Aragorn going after him, sending Boromir to look after Merry and Pippin, who have also run off. 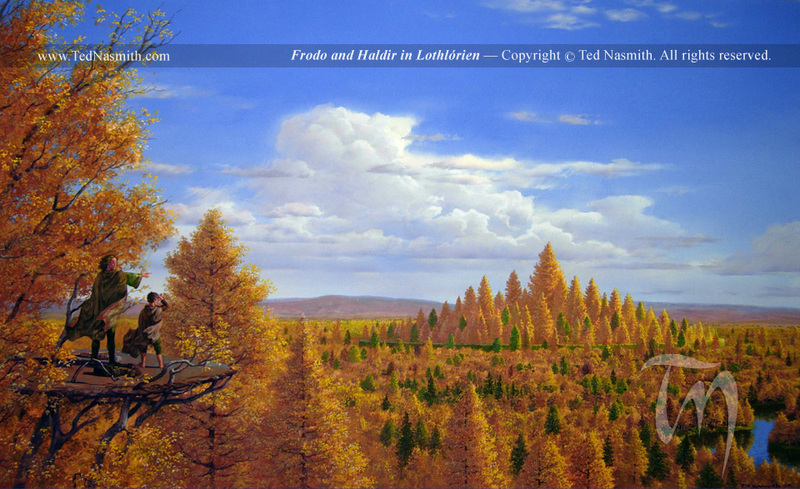 Legolas and Gimli also go to search for Frodo. 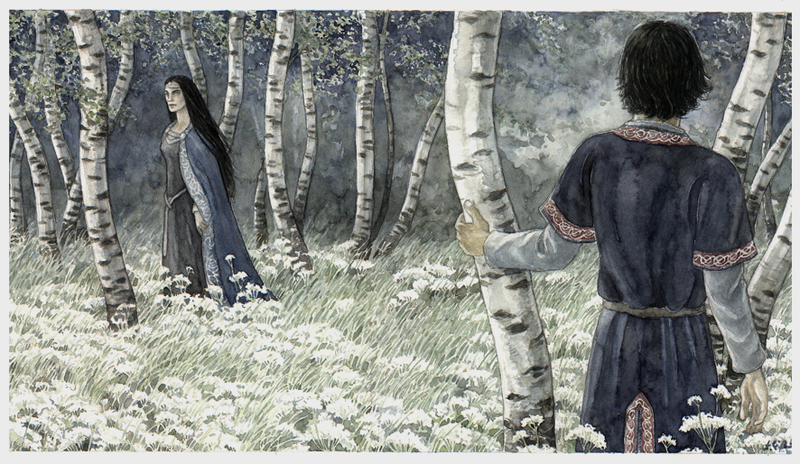 Aragorn stops Sam, saying there is danger near. He goes to the top of Amon Hen. Sam however, heads back to the boats. 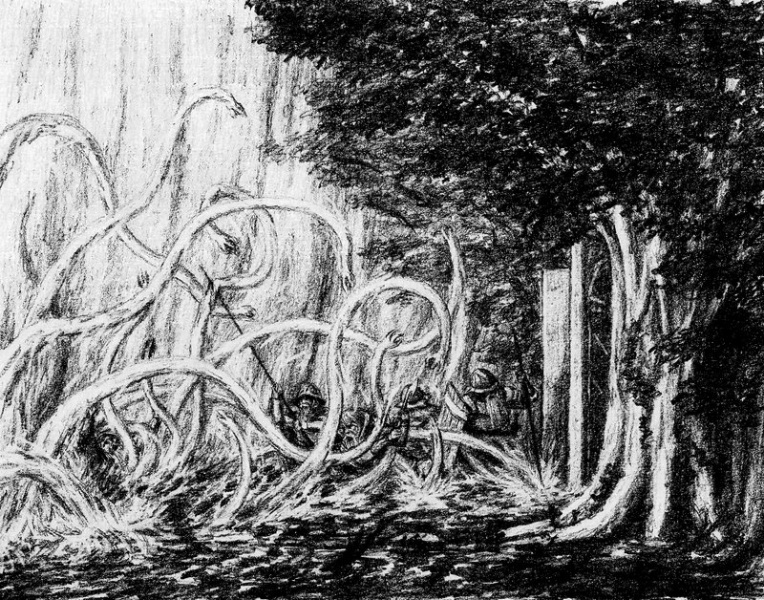 Aragorn comes across Saruman’s host of orcs. Legolas, Gimli, Merry and Pippin are also ambushed. 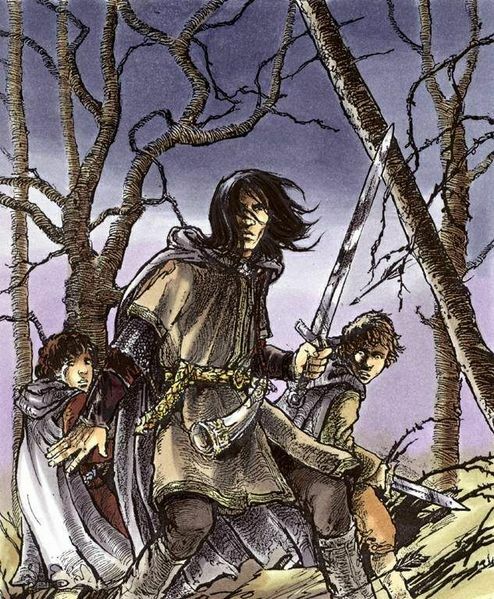 Boromir comes to the aid of Merry and Pippin. Frodo, still invisible, escapes the orcs. Boromir sounds his horn. Legolas and Gimli come to Aragorn’s aid. They run to help Boromir. 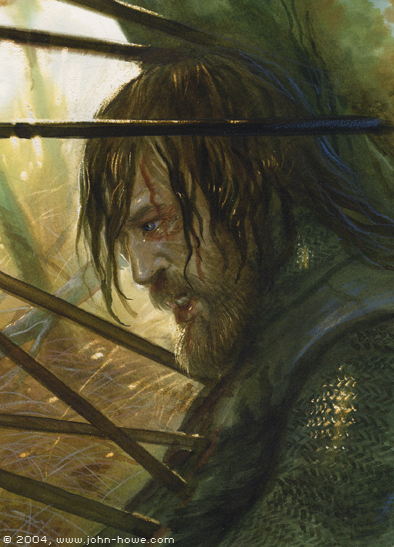 Boromir is pierced by arrows, but remains standing. He tries to save Merry and Pippin from being taken, but he falls at last. 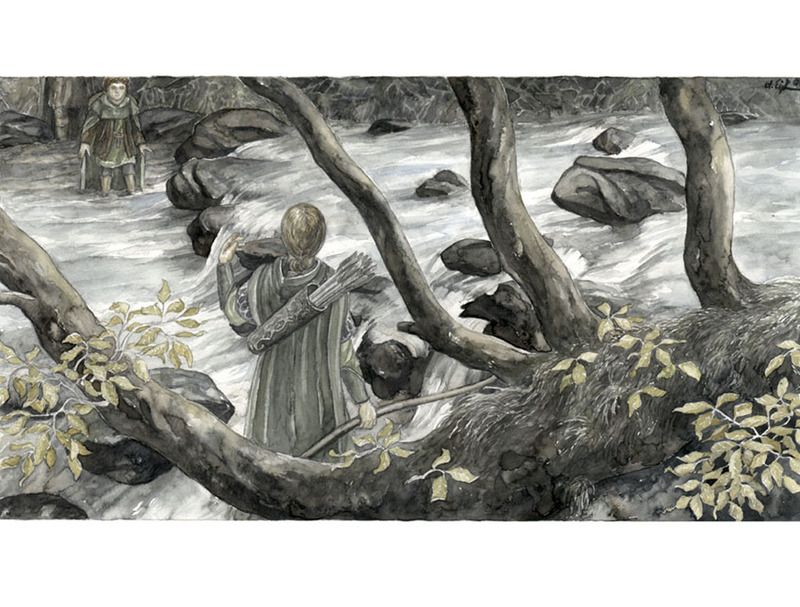 Aragorn comes across Boromir dying. Boromir admits he tried to take the Ring. Frodo reaches the boats. He begins to cross the river but Sam chases after him. 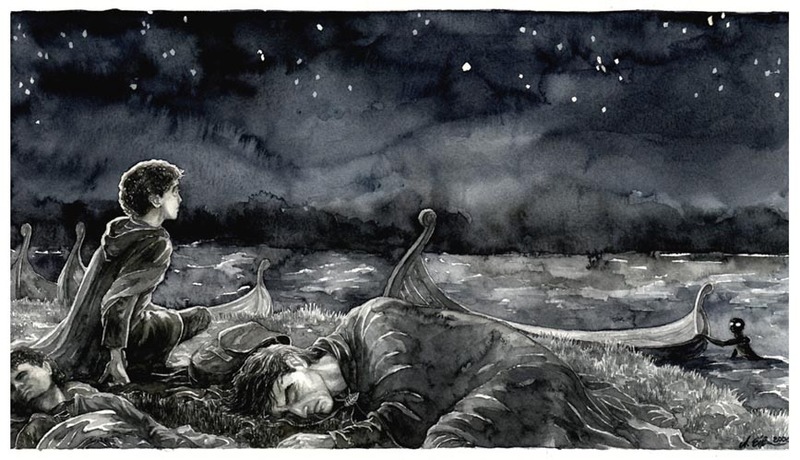 As Sam struggles in the river, Frodo drags him on to the boat. They leave for Mordor together. 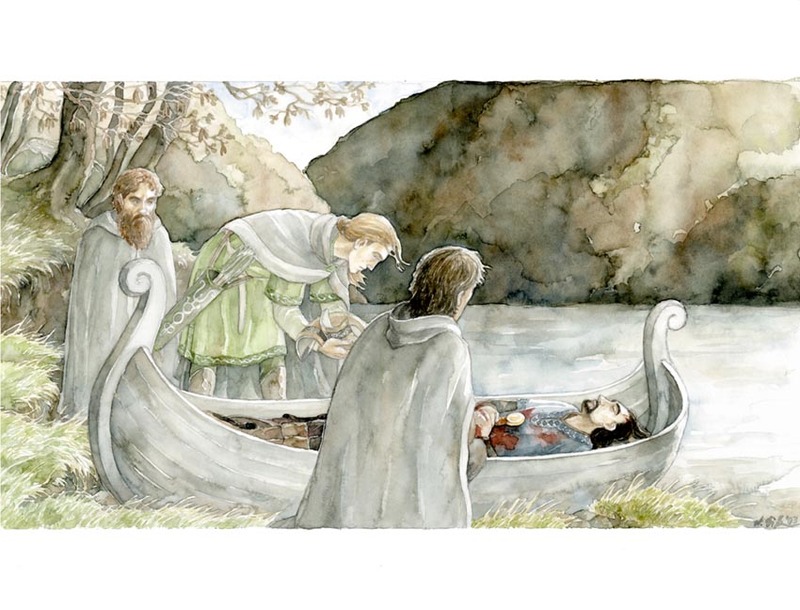 Aragorn, Legolas and Gimli place Boromir’s body in a boat and send it down the falls. Instead of going after Frodo, they choose to chase after the orcs that took Merry and Pippin. Adapted from chapters ‘The Great River’, ‘The Breaking of the Fellowship’ and ‘The Departure of Boromir’ of The Lord of the Rings.